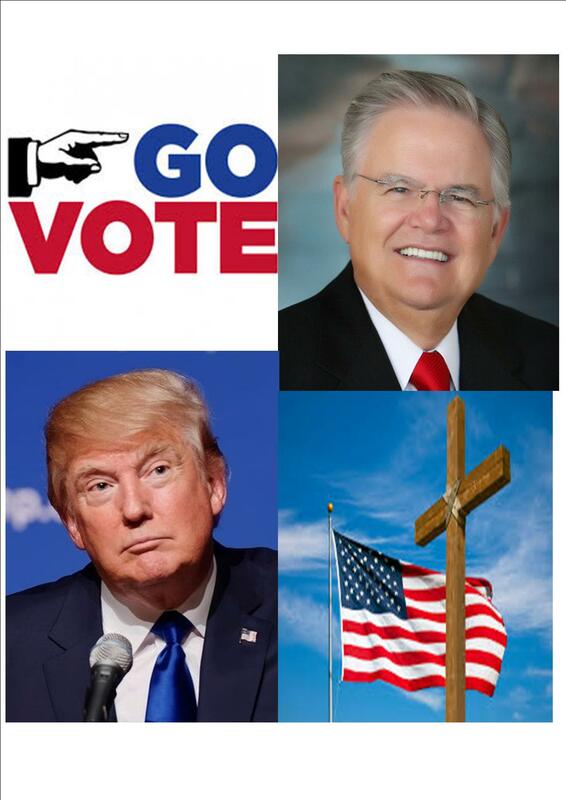 Christian – go and vote and make sure it is for Trump!? Before dissecting this article and giving my own thoughts on it, some background (personal and general) is called for. Going back to the recent local elections, I recall two incidents relating to this article. The first relates to my just turned 18 son (and since it is family details I give are scant). I told him he should vote, he should vote intelligently based on what he saw will be the best outcome, and if he was still unable to decide then he should spoil his ballot paper. I believe he followed my advice but also voted differently to me! The second relates to when I was telling at the polling booth on polling day. One of the voters was an elderly lady I knew well because we once belonged to the same church. She told me her parents (who I knew and respected) made it a point NOT to vote as did most members of that church, 60 years ago say, the reason being mostly theological. Clearly things had moved on since then! In checking out the article, I found it, unsurprisingly, originated from an organization called “Right Wing Watch”, with its strapline: “A project of People for the American Way dedicated to monitoring and exposing the activities of the right-wing movement”. Checking out Wikipedia to inform my understanding of where Hagee lies on the ecclesiological spectrum, I find: “John Charles Hagee (born April 12, 1940) is the founder and senior pastor of Cornerstone Church, a charismatic megachurch in San Antonio, Texas Hagee is also the chief executive officer (CEO) of his non-profit corporation, Global Evangelism Television (GETV)…” As far as I am concerned, this places him clearly in the camp of the American religious right and, sadly, one that too often upholds some of its worst excesses and wrong theology. But I should add that it was this group, more than most, that steered me away from my former sitting on (or rather above) the political fence and taking a more proactive approach to politics, although I have since recoiled from its prioritization of issues, its divisiveness and its influencing us on who to vote for. This got me thinking on where I stand on the US Presidential candidates (discussed in previous blogs) and some of the issues Hagee raised as being of importance. I suppose it I were a US citizen and had to cast my vote for either Donald Trump or Hilary Clinton, the two front runners, neither of which I like, rather than not turn up to vote I would spoil my vote and if opportunity allowed write on my ballot paper something along the lines: “I don’t like Donald or Hilary and therefore cannot support either, but I do believe in a merciful God and turn over my concerns to him”. I should add though that in the times I have voted I don’t ever recall spoiling my ballot paper although I have sometimes voted for the least of the available evils and have generally advocated that people ought to thoughtfully vote for someone if at all possible. Swiftly, going through Hagee’s points, many of which contain at least a grain of truth … While there is a case from a strong American military to help safeguard world peace, arguably it has often in the past aggravated tense situations. While America has an immigration problem (as does the UK) building a wall between it and Mexico and stopping Muslims coming into the country is not the approach I would advocate. Trying to restrict American jobs going to China and the like, maybe a laudable concern, history shows that protectionism often brings worse consequences. While a Jewish dominated Israel may have a right to exist, giving unconditional aid in the light of its human rights abuses is not justifiable. While standing for our country and patriotism may be noble aims, so is standing for the needy wherever they are placed. Sadly in all his rhetoric, hardly a mention is given to helping the poor and disadvantaged, and as for Trump, he is hardly a good advert for Christian living! All things considered, I have to oppose Hagee’s arguments and declare them to be unhelpful, unbalanced and unbiblical. But Hagee is right in this regard – he like us all, is accountable to the Almighty yet we are all called to practice truth, justice and righteousness.